Eurozone countries should exploit an economic recovery to cut their budget deficits and make labour markets more competitive, a think tank has said. The Organisation for Economic Co-operation and Development (OECD) said governments must focus on reforms to consolidate their economic progress. 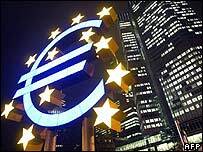 Of euro members, excluding newly joined Slovenia, only Germany was planning "ambitious" deficit cuts, it said. Germany has raised its value added tax to try and improve its public finances. The Paris-based OECD called for more integration in key sectors of the economy, such as financial services and a reduction in job protection policies it said were stifling economic activity. "A key lesson from the early years of economic and monetary union is that resilient economies tend to thrive whereas inflexible ones have a rough ride," the Paris-based body said. Eurozone members are supposed to keep their budget deficits below 3% as part of the financial rules underpinning the single currency. But this rule has been regularly flouted since 1999 by many of Europe's largest economies, including Germany, France and Italy. However, the European Commission expects all three countries' deficits to be below 3% of gross domestic product (GDP) by the end of this year. Growth across the 13-member eurozone is expected to slow this year although Brussels says growth will still be "robust".